During last Friday’s webinar with guest speakers Bill Bengen and Greg Brousseau, we conducted a series of polls. The results are surprising. Based on answers to our polls, advisors are sticking with the traditional buy-and-hold asset allocation doctrine that has dominated the profession for two decades. Advisors say they have not reduced equity allocations. But they are looking for a less dogmatic approach. Here are the results of the poll from the webinar attended by about 120 advisors. Beta testing of the Advisor Products Inc.'s (API) application for Online Reporting For PortfolioCenter has been a great success and we are now focused on improving web reporting for advisory firms using PortfolioCenter. Beta testers gave API Online Reporting For PortfolioCenter rave reviews and some great suggestions for improving the application. Seven advisory firms participated in the beta test by uploading their client reports to our server, which successfully parsed client reports and deposited them into secure folders accessible to clients. When the stock market plunged last week—bottoming with a loss of 40% from the all-time high reached October 9, 2007—we began a free service to help financial advisors manage client communications: a daily market update that you can copy, paste, and email to your clients. The daily updates contain a summary of thoughtful stories covering the day’s events. These short takes on the financial tumult are intended to be used as a daily reminder to clients that you are in touch with them and on top of the situation. Why Do We Charge Less? Because We Can! We recently found ourselves in a peculiar position. It happened when we launched dynamic online performance reporting for PortfolioCenter and a new online vault. Ironically, offering more features at lower prices than our competitors inspired skepticism. While advisors were thrilled to hear that we can save them money—especially since financial crisis has pummeled asset prices and, thus, advisory fees—their enthusiasm is tempered by suspicion. Charging low prices raised a question in the minds of some advisors: If their firm for years had been paying twice as much for online reporting, why is Advisor Products charging so much less? If you’re one of the 3,400 advisory firms using Schwab PortfolioCenter™, we have some good news about sharing performance reports with your clients online. 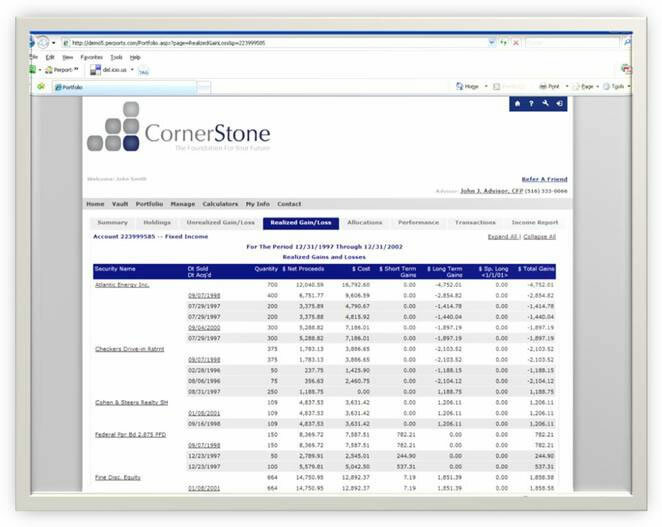 Online Reporting for PortfolioCenter, a new system now being beta tested by Advisor Products Inc. (API), is less costly, better designed, and easier to use than previous solutions for providing PortfolioCenter reports to clients online. Financial advisors for years have clamored for an all-in-one solution combining portfolio management, customer relationship management, and financial planning software into a single platform. Combining these three functions, which are essential to any advisory firm that wants to adhere to best industry practices, has been an elusive goal. Years ago, I branded the long-sought breakthrough application “The Silver Bullet,” evoking the legendary powers of the only weapon capable of killing a werewolf. But the all-in-one application has proved elusive. So persnickety is the typical independent advisor (IA), he couldn’t work for anyone but himself. That’s why he chose to be an independent advisor. No single application incorporating portfolio management software (PMS), financial planning software (FPS), and customer relationship management (CRM) could ever be widely adopted. Uncompromising entrepreneurs don’t want a Veg-O-Matic—the kitchen appliance that sliced, diced, broiled, and boiled. A Swiss-Army-knife approach would be unacceptable. The recent integration of Albridge Solutions’ portfolio performance reporting application and Advisor Products Inc.’s Personal Client Portals™ system makes any advisory firm more scalable, efficient, and client-centric. But what’s more exciting is that it will promote financial planning to millions of American households by making it easier for them to understand, measure, and manage their progress toward achieving long-term financial goals. Since the early 1980s, thought leaders, professional membership associations, and governing bodies have strived to professionalize personal financial planning so it can be embraced by the mass affluent. The elusive but irresistible goal has been to deliver financial planning advice within a prescribed, systematic, and ethical framework to the masses. The challenge has been that providing financial planning services while adhering to best practices articulated by the FPA, CFP Board, NAPFA, Fiduciary 360, and other such groups is extremely labor intensive. Advisor Products added an interface for Black Diamond Reporting to its Personal Client Portal platform this past week, allowing financial advisors to securely stream holdings, asset allocation, and performance data to individual clients automatically daily. Using the latest technology for integration, an XML Web Service, the interface between Black Diamond and Advisor Products feeds each client of an advisor continuously updated performance reports with no work required by the advisor. T he Black Diamond report displayed on your clients’ Personal Client Portals has three tabs. If you’ve been yearning for a way to use the Internet more effectively with clients, check out our new Personal Client Portal platform. It fills a gap between your firm’s existing software applications and your clients. This is a new type of application, and there is nothing else like it. Your financial planning, performance reporting, and customer relationship management applications are disconnected from your clients right now. Our new portal system bridges the gap between your applications and your clients. Writing The Gluck Report in Financial Advisor Magazine, I get to research topics I’ve been covering in for most of my 25 years as a reporter—wealth management strategies, financial planning software, advisor marketing, and just about anything else involving advisors. But what’s frustrating is that I don’t get to write about my company. And that’s why I’m hoping you’re going to want to read this blog. Advisor Products, which I founded in 1996, has been pretty damn innovative. In 1996, we offered the first client newsletter that allowed advisors to pick every story. In 2001, we launched the first email-newsletter marketing system targeted to advisors. Last year, we rolled out the first 12-page template brochure ever offered to financial advisors. But not enough advisors ever get to know about most of our innovative work.